UAB Honors College freshmen go dumpster diving as part of a sustainability seminar led by Julie Price, Ph.D., UAB sustainability coordinator. After collecting the full bags, they separate trash from a UAB building into different waste streams, identifying items that can be recycled, composted, or sent to a landfill. The amount of waste—and the amount that can be reused—shocks students, giving them a better understanding of sustainability challenges and opportunities, says Price (pictured below in third photo). “In terms of weight, at least 50 percent of what we find is compostable,” she adds. 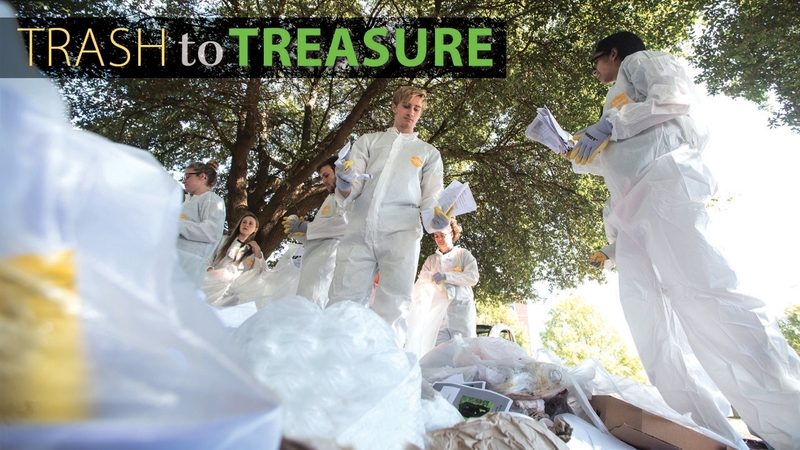 Throughout the semester, the students conduct several of these waste audits, and their findings help shape UAB recycling efforts, Price says. What’s the most unusual gem they have unearthed in the rubbish? A giant cutout of Arnold Schwarzenegger’s head, which a student promptly rescued and took home. • Discover the opportunities for education and experience in the UAB Honors College. • Learn more about UAB's sustainability efforts in class and on campus. • Give something and change everything for UAB Honors College students.